We report a newborn with an unusual combination of aneurysmally dilated thin-walled right ventricle with hypertrophy of the apical muscles of the right ventricle. There was narrow pulmonary annulus, pulmonary regurgitation, and hypoplasia of the mitral valve and left ventricle. We propose that this heart represents a partial form of Uhl`s anomaly. 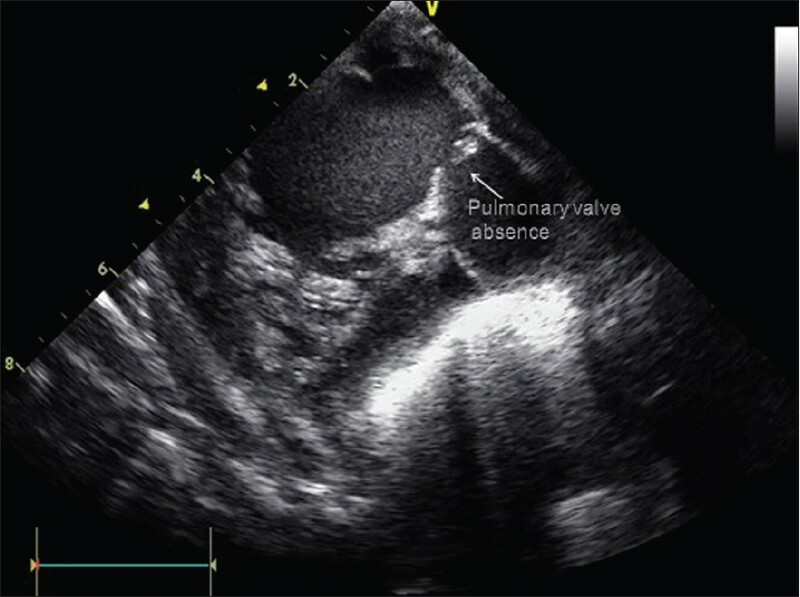 An aneurysmally dilated right ventricle was suspected in the fetal echo at the 24-week gestation in a baby, but a detailed evaluation was not done. The baby was delivered by a planned Cesarean section without any complications. He weighed 3 kg; the APGAR scores at the first and fifth minutes were 5 and 7, respectively. The oxygen saturation was 85%. A pansystolic murmur was heard. The chest X-ray showed marked cardiomegaly and a cardiothoracic ratio of 85%. Echocardiography showed an aneurysmally dilated right ventricle [Figure 1], [Video 1], [Video 2] and [Video 3]. The entire right ventricle except the apical portion was dilated. There was apical muscular hypertrophy of the right ventricle. [Figure 1] The tricuspid valve was mildly hypoplastic (Z score -0.95) and prolapsing, but not displaced. The pulmonary valve was dysplastic and doming [Figure 2], with mild pulmonary regurgitation [Figure 3]. Although the pulmonary annulus was not very small, the anatomy resembled absent pulmonary valve. The left ventricle was compressed by the dilated RV and measured 18 mm in the end-diastole (Z score - 0.13), but the mitral valve was only 5.5 mm. There was a large patent ductus arteriousus flowing left to right, with a low velocity flow. There was no family history of any cardiac illness. Multislice computerized tomography revealed right ventricle aneurysm. In addition, it showed a very thin RV wall measuring 1.4 mm in some places. A cardiac catheterization done on day 10 revealed pressures of the right atrium: 7 mmHg, right ventricule: 67/0 - 9 mmHg, pulmonary artery: 62/21, (mean 34 mmHg). Aorta: 75/55 (mean 60 mmHg). Aortic and pulmonary artery saturations were 97 and 93%, respectively. The baby continued to require mechanical ventilator support and inotropes, and died on the fifteenth day of life. An autopsy was not done. The muscle loss in Uhl`s anomaly results from apoptosis rather than from lack of development. The septal components, septomarginal trabeculations, and papillary muscles of the tricuspid valves are normally muscularized in Uhl's anomaly. This may suggest a different embryological origin of these tissues that are spared in Uhl`s anomaly. Partial forms of Uhl's anomaly may not be well recognized. , There may be embryological or other reasons for some components of RV being muscularized. An analysis of the partial forms of the Uhl's anomaly might be of interest and shed more light on the pathogenesis of the disorder. Cases similar to ours, with aneurysms involving RV outflow tracts have been previously reported. ,, We hypothesized that our patient represents a variant of Uhl's anomaly. In the absence of histological confirmation, this assertion remains less than established. In any case, the present case has a very unusual anatomy and combination of lesions. The remarkable thin-walled RV supports the likely possibility of a partial Uhl's anomaly. In conclusion, we report a neonate with an aneurysmally dilated right ventricle with thinned out walls, but an apical hypertrophy, dysplastic pulmonary valve, and hypoplastic mitral valve. The lesion may represent a partial variant of the Uhl's anomaly. 1. Gerlis LM. Uhl's anomaly. Orphanet encyclopedia, January 2003. Available from: https://www.orpha.net/data/patho/GB/uk-uhl.pdf [Last accessed on 2013 Mar 3]. 2. Williams JA, Collardey KR, Treadwell MC, Owens ST. Prenatally diagnosed right ventricular outpouchings. A case series and review of literature. Pediatr Cardiol 2009;30:840-5. 3. Vaidyanathan K, Agarwal R, Johari R, Subramanian R, Cherian KM. Isolated congenital pulmonary regurgitation with right ventricular outflow tract aneurysm- a rare variant of Uhl's anomaly. J Card Surg 2010;25:415-7. 4. Graham TP Jr, Smith CW. Aneurysmal dilatation of the right ventricular outflow tract in infancy: Severe form of Uhl's anomaly? Cathet Cardiovasc Diagn 1977;3:397-407. 5. Uhl HS. Uhl's anomaly revisited. Circulation 1996;93:1483-4. 6. Gerlis LM, Schmidt-Ott SC, Ho SY, Anderson RH. Dysplastic conditions of the right ventricular myocardium. 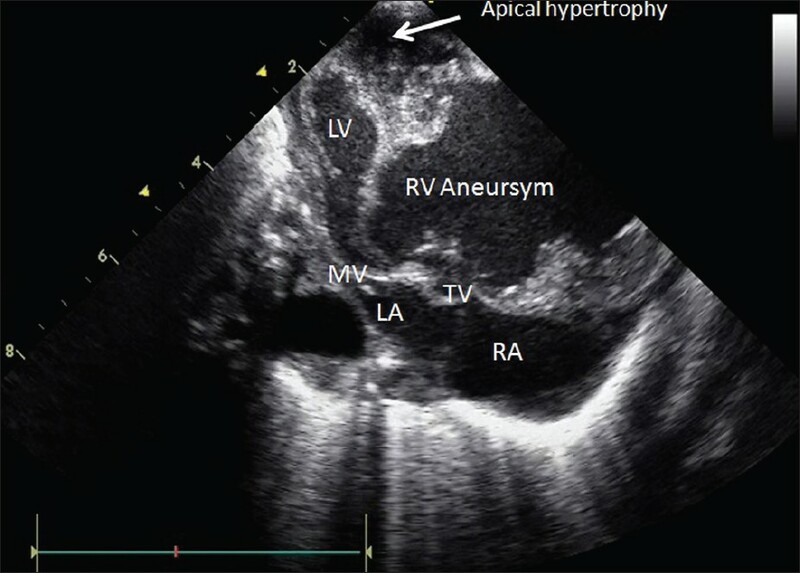 Uhl's anomaly vs. arrhythmogenic right ventricular dysplasia. Br Heart J 1993;69:142-50. 7. Güler N, Demirbag R, Eryonucu B, Gül A. A case of successful six consecutive deliveries in a 41-year-old woman with Uhl's anomaly. Int J Cardiol 2003;87:283-5. 8. Takizawa K, Suzuki S, Honda Y, Kaga S, Inoue H, Matsumoto M. Long-term survival of Uhl's anomaly with total cavopulmonary conversion. Asian Cardiovasc Thorac Ann 2009;17:203-5. 9. Song BG. 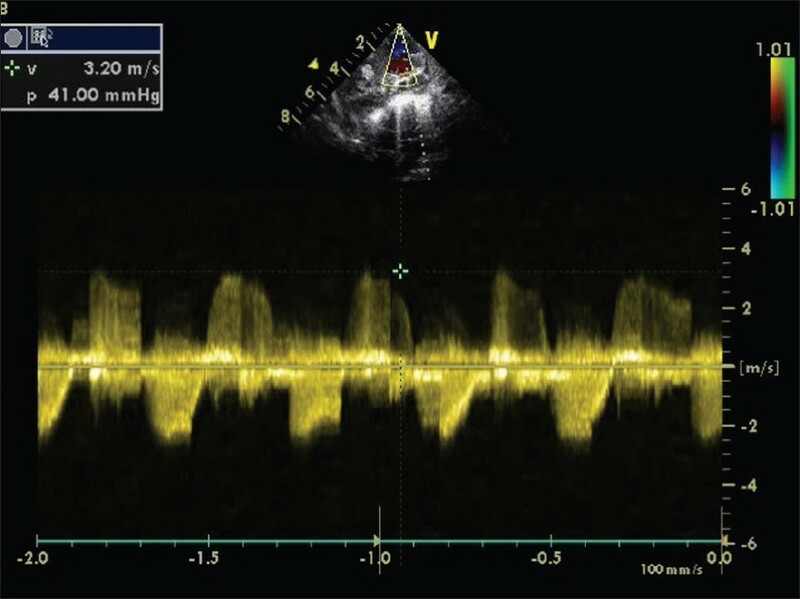 A rare case of partial absence of the right ventricular musculature in asymptomatic adult man: Partial Uhl's anomaly. Heart Lung 2013;42:215-7. 10. Honda K, Sekiguchi A, Chikada M, Noma M, Miyamoto T. A case of large congenital right ventricular outflow aneurysm. Kyobu Geka 1999;52:846-9.